The construction of the Shanghai Tower is a testament to architectural skill and China’s growing economic power, but does this come at the expense of vibrant street life? Photo by Jerry Yang/Flickr. Shanghai Tower, designed by transnational architecture design tycoon Gensler, will soon become the third tallest building in the world this year. Once complete, it will proudly join Shanghai’s already crowded skyline, which currently consists of the Oriental Pearl TV Tower, Jin Mao, and the Shanghai World Finance Center. The tower is located in the locality of Luijiazui, China. Twenty years ago, Luijiazui was mainly farmland with simply a handful of warehouses and wharfs. Two decades later, it has become China’s Wall Street, with Lujiazui’s Finance and Trade Zone being the only finance and trade zone amongst the 185 state-level development zones in China. Yet, this massive economic growth and the ensuing architectural achievements come with large questions of what this will mean for access and walkability within China’s cities. While China’s economic growth is impressive, this rapid expansion of wealth brings with it a myriad of challenges. One such challenge is how the city will maintain or even increase walkability to help its residents maintain healthy lifestyles. Obesity rates in China have skyrocketed as the economy has boomed. The rising purchasing power of the Chinese citizens has increased the availability of fast food and the extra funds to buy such goods as cars. Meanwhile, China’s worsening air quality and an increasingly sedentary lifestyle has also meant there has been lower numbers of people able to walk in the city to get a healthy level of exercise. This has led Associate Architecture Professor of Syracuse University, Jonathan Solomon, to say that perhaps ‘walkability’ needs to be redefined in the Chinese context. There might be an ‘alternative’ walkable urbanism possible in which Shanghai Tower and other members of the “high tower family” can become neighborhoods where people essentially do their walking within the tower or between clusters of towers. Shanghai Tower rendering. Image by Gensler Architects. The above is an outrageous statement for urban planners who are trained in the new urbanism movement that has swept across Europe and North America, in which ‘walkability’ measures pedestrian-friendliness and safety for actual streets, not the walkability of elongated hallways. Stacking different services vertically like shoe boxes in a tower and building pedestrian corridors to connect them does not equal improving walkability, especially when Chinese officials decide to keep inserting notorious 100-meter wide roads around these towers. 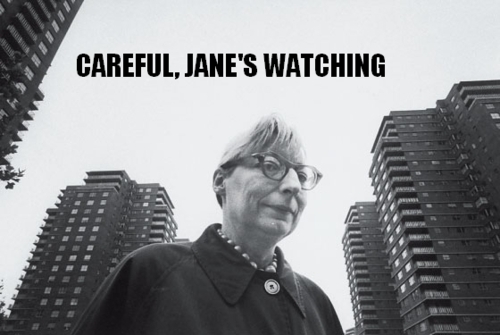 This leaves the rich able to swiftly move around the city, only interacting with those who can afford to live within the towers, while leaving the infrastructure for the majority of the city’s residents to degrade. Yet Solomon’s fellow architects at Gensler seem to side with him, as their design of Shanghai Tower comes complete with walkable spaces inside the tower and closed off pathways between the towers. In the marketing material, efforts seem to be made to make sure ‘separate elevators shuttle people among zones, and below-grade parking links via walkways to the nearby super-high-rise towers.’ This ideology is reminiscent of Le Corbusier, a strong advocate for high towers disconnected with street life. In Le Corbusier’s defense, high towers provide more access to sun, space, and greenery while allowing cities to house dense networks of people. It might be possible to foster social relations by making community spaces, or ‘earthbound neighborhoods in the air’ where people interact in those spaces. Yet, this is only a thin façade of urbanism, as this means only some people will be included in these private neighborhoods. 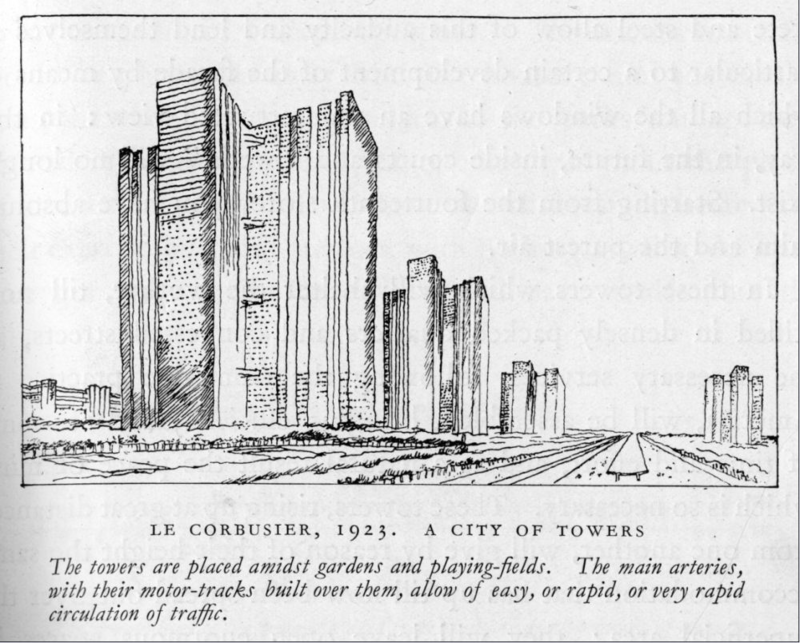 “A City of Towers.” Sketch by Le Corbusier. Le Corbusier would love Shanghai Tower and the Lujiazui locality as a whole, or at least its exterior. Unlike Pruitt-Igoe, one of Le Corbusier’s designs, Shanghai Tower is not a single-use affordable housing project building. According to Gensler’s program, the tower hosts retail, entertainment, luxury hotels, office space, and cultural venues. With the Shanghai tower, only those who can afford to are privileged to work, shop or attend conferences in the building. Claiming high towers are improving walkability of the whole society is like having a gym in the corporate building and claiming this policy improves ‘public’ health. Architects’ current penchant for building mammoth towers stands in opposition to urban planners who focus on people-centered design. Cities are not simply an accumulation of buildings, but a product of the interaction of people with each other and their surroundings that happens at the street level.CC Cities should be pedestrian-friendly, with short streets that prioritize walking, and infrastructure that allows for biking instead of high-speed thoroughfares. This international competition for the tallest tower might boost country self-image in the short term, but in the long term might leave no one the winner. And the fierce competition for height seems to have just begun. The tallest building for the moment is the 828-meter Burj Khalifa in Dubai, but Chinese architects and engineers have already moved on to their next project. 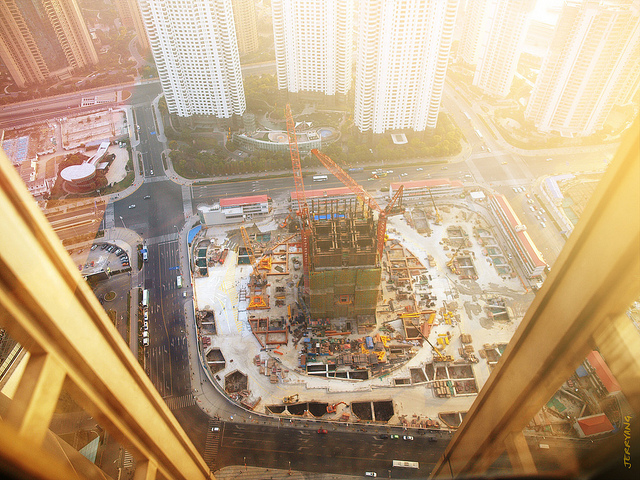 According to CNNgo, a Chinese construction company called Broad Sustainable Building (BSB) has spearheaded to build ‘the Sky City’ of 838 meters in Changsha, China. How tall can these towers go? For now, it seems only the sky’s the limit.